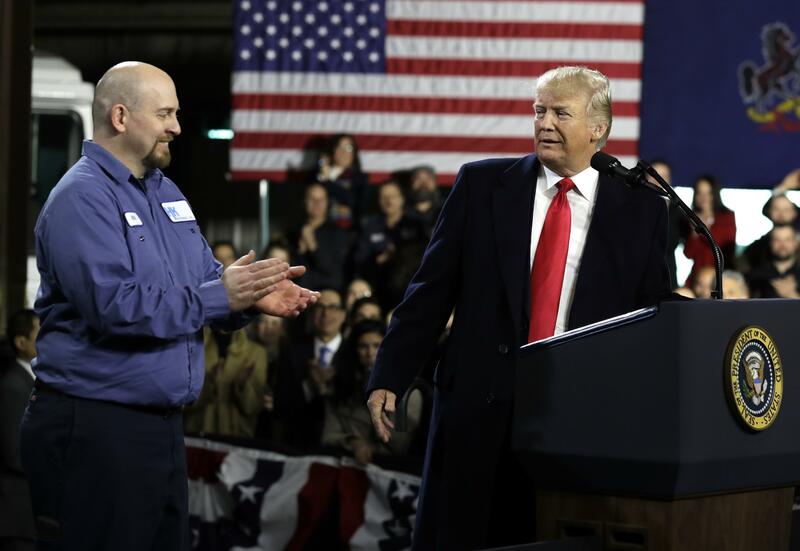 Thu., Jan. 18, 2018, 1:01 p.m.
CORAOPOLIS, Pa. – President Donald Trump is pledging “total support” for a Pennsylvania lawmaker trying to keep a House seat in the Republican column in the first congressional race of the year. Trump tweeted an endorsement of the candidate, Rick Saccone, hours before arriving in the state Thursday to tout newly enacted tax cuts. The White House quickly issued a statement saying the president was visiting the Pittsburgh area to promote tax cuts, not to campaign. Saccone faces Democrat Conor Lamb, a former Marine, in the March 13 special election. The seat opened up when Republican Tim Murphy resigned after acknowledging an extramarital affair. Democrats are looking for a win to build on their Senate victory in conservative Alabama and lay the groundwork for gains in November’s midterm contests. Published: Jan. 18, 2018, 1:01 p.m.